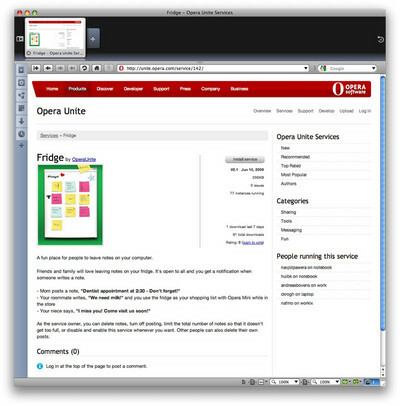 Opera Unite web browser turns any computer into both a client and a server, allowing it to interact with and serve content over the internet. Basically, Unite turns any computer or device running Opera into a Web server. Checkout it’s features. You can access your MP3s, documents and other important files from office or any other machine connected to Internet. Instead of uploading your personal photos or videos to Flickr or Google Picasa etc, just connect your camera to the computer and copy files to the designated folder and securely share your personal photos to your friends and family anywhere in the world. Host your Web sites for free (free web hosting 🙂 )from your local computer. Go to labs.opera.com, download the Opera Unite software and install it. Start the Opera Web browser. Enable the Opera Unite service (lower left corner). Send the URL to share the files to friends and family. That’s it, you are now running a web server on your machine and shared files to your friends. Public: Your content is accessible by anyone who types in your Opera Unite URL. Do not use this level of access if you are concerned about the privacy of your selected content. Limited: Limit access to only those with the full URL. The URL has an authorization password included. Checkout Opera Unite User Guide for reference.